Romney's Nevada Problems Explained By A Political Scientist Who Voted For Him : It's All Politics Nevada political scientist Eric Herzik, who twice voted for Romney in caucuses, told NPR's Don Gonyea that Mitt Romney isn't doing as well in the state as might have been expected, despite Nevada's nation-leading unemployment rate. He's failed to personally connect with voters and hasn't given enough details about his economic proposals, Herzik says. Mitt Romney at a Las Vegas fundraiser last week. Nevada, with its six electoral votes, is far from the biggest Election Day prize sought by President Obama and Republican challenger Mitt Romney. But in a race that could be so close that neither candidate can afford to concede a single electoral vote, Nevada is being courted by the candidates to a degree far greater than its size would suggest. Also, while Obama carried the state by 12 percentages points in 2008, the Great Recession hit the state hard, with widespread foreclosures and high unemployment. To get a reading on the state of the presidential race in Nevada, NPR's senior political correspondent Don Gonyea talked with Eric Herzik, who chairs the political science department at the University of Nevada, Reno. Herzik is one of the most knowledgeable observers of Nevada politics. In an interview for All Things Considered, Don asked Herzik to explain how Romney's recent problems are playing out in Nevada. HERZIK: "Well, just as it's played nationally, it's taken him off message, and it's provided further distance between Romney and the so-called average voter." "When your tax returns get released and you're making, say, $14 million and you're saying, 'Hey, I was unemployed,' that just doesn't resonate, particularly in a state with 12.3 percent unemployment. "The other thing that you're seeing — and it's partially this week, it's partially from the Democratic convention — the Democrats have now coalesced on a message and all their parts, and particularly in Nevada, are hitting on all cylinders. Labor is out walking for Obama and the Democrats. Obama's organization — not quite as strong as '08, but still far stronger than anything the Republicans have. The Democratic Party organization, linked largely to [Senate Majority Leader] Harry Reid [of Nevada], is also out there, outworking the Republicans on the ground." Don asked Herzik what he's seeing, or not seeing, in the Republican operation in Nevada. HERZIK: "It's more what you're not seeing in the Republican Party. The Republican Party in the state is a total disarray. You've got dueling Republican central committees in Clark County, which is Las Vegas. The Ron Paul people basically captured the Republican Party. ... The delegation that went to the Republican convention was a Ron Paul delegation, it wasn't a Romney delegation. You've even got electors now appointed by the Ron Paul people. Two of them came over last week and said, 'Well, we may not vote for Romney. We may vote for Dr. Paul.' That is not what a Republican Party needs 50 days out from an election." The discussion quickly turned to the economy. Nevada has the nation's highest unemployment: It was 12.1 percent in August. Romney's central argument for why he should be president, of course, is that he has the experience to fix the economy. It would seem a message tailor-made to the state. 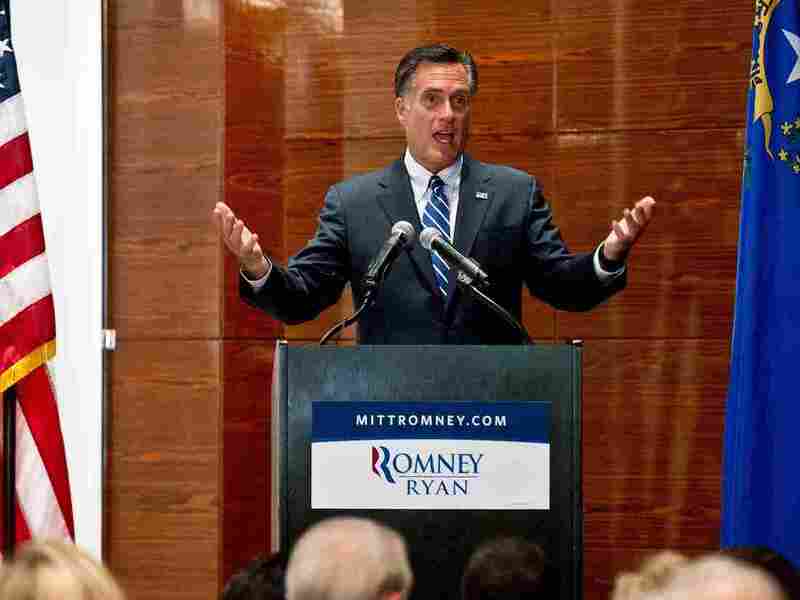 Yet it hasn't succeeded in giving Romney momentum in Nevada. Don asked why that is. HERZIK: "If the election was just on economic statistics, the game would be over. But the problem for the Republicans is, where Nevada voters are willing to look at an alternative, you have to have an alternative. "And Romney has come into the state and given few details, simply said, 'Well, we'll cut taxes and cut regulations,' unspecified, 'and everything will be better.' But Nevadans have seen this story before. We don't have a state income tax, for example. So if it's all about taxes, well, we should be leading the nation in the recovery. "In terms of specific issues, what are you going to do about the housing market? And Romney's answer, while it may be totally honest, but it's a tough love [answer] — and he said this in north Las Vegas — 'Let the market sort this out.' Well, when you're about to lose your house, that's not a very satisfying answer." Don asked if the failure to really address these economic issues with credible specifics has hurt Romney more than, say, the Republican nominee's tax returns or the secretly recorded campaign fundraiser video. HERZIK: "I think it all comes together with a message of, 'So this guy's telling me, give a tax cut to millionaires — which is the Democrat ad. I mean [Democratic Senate candidate Rep.] Shelley Berkley's using it against [Republican Sen.] Dean Heller. Around the nation, Republicans trying to appeal to independent voters in tight Senate or House races have distanced themselves from Romney. Don asked if that has happened in Nevada. "It wasn't a case of, 'Oh, Romney is just, I can't go anywhere near him.' But it's more, 'No, I don't think it accurately portrays ... the majority of Americans, and I'm just going to represent all Americans,' hence Nevadans." Don noted a recent Romney visit to Las Vegas in which the Republican nominee gave his stump speech but didn't fill in many, if any, details about his proposed policies. He asked Herzik if that wasn't a lost opportunity, given what the political scientist said about Nevadans wanting more details. HERZIK: "Well, and just being here is not a bad thing. I mean, the state's getting a lot of attention. I mean, when Obama comes, he gives a pretty set speech and Nevada gets a lot of visits. But for Romney, if you don't come with a more specific message — and this has hurt him nationally — people are starting to say, 'OK,' but in a sense, 'Where's the rest of the story?' And until he is able to develop the rest of the story and connect with the average voter, he's going to continue to struggle in the polls." Speaking of polls, where does the presidential race in Nevada stand based on those surveys? HERZIK: "Obama has consistently held a lead. Depending on when it's done, it's either 2 to 4 percent. The last poll I saw, he's up now by 6 percent, which is outside of the margin of error. That was after the Democratic convention, so you have to factor in that bump factor. ... So right now, Obama is enjoying a lead, and if I'm 50 days out, I'd rather be there than saying, 'Oh, but we're within the margin of error.' "
That's not to say Nevada still isn't a battleground state and Washoe County, where Reno resides, isn't a battleground county, Don observed. HERZIK: "Absolutely. I believe it will be a battleground state and a battleground county up until the last two weeks, and that's been true in Nevada since 1992." Anything left to add? Don asked. HERZIK: "To me, the factor now that would be most troublesome if I'm a Republican operative is the lack of a ground game and this coalescing of Democratic groups: labor, Latinos, the traditional Democratic Party and the Obama organization. And they're firing, they're out, they're walking, and the Republicans are just getting started. "I live in a very Republican neighborhood. In the last, probably 12 days, knocking on my door have been two separate Obama groups. And last Wednesday, I went home a little early from work, it's like 3:30, two AFL-CIO folks out there saying, 'We're walking for Obama.' And I'm like, 'This is a Republican neighborhood, guys, come on!' No Republicans at my door, and there are two registered Republicans in my household and only one registered Democrat. So it's like, they're out and they're talking to everybody." This was obviously a very interesting anecdote about what's actually happening on the ground, at least in one subdivision in the Nevada desert. Don asked Herzik a logical follow-up: Was he the household Democrat? HERZIK: "No, I'm one of the Republicans. And showing a problem with Mitt Romney, I use this as kind of a ... "
It turns out Herzik's wife is the Democrat, a fact Herzik said underscored another issue for Romney. HERZIK: "So the female in the household is a Democrat, and that's another problem for Romney. I mean, his connection to female voters is just — well, nationally the gap is what, like 15 percent? It's got to easily be that in Nevada." Herzik told Don he didn't mind being identified as a Republican in the story. In fact, he often is by the media. He even jokes that he is "THE college Republican professor." HERZIK: "The! There's only one." He was joking, of course. But he was serious about his criticism of Romney's campaign. And Herzik identified himself as a Republican who has voted for the former Massachusetts governor before. HERZIK: "And I've voted for Romney twice now. I voted for him both times in the caucus." "You know, it's like, 'Come on, guys.' And that's the lack of connect with the voters, Republican or otherwise."